When Pigs Fly Returns: Predatory Magpies! I saw something a little ghastly yesterday. On my way up to the office, there's a hill filled with trees and brush. On that hill, I heard a great deal of squawking and chirping. I walked up to the hill and saw two magpies chattering at each other. One of them was standing on top of a poor little woodpecker! The woodpecker was squeaking and often scared. I shoo'ed the magpies away. They didn't really fly away as much as hop off to the side. The woodpecker was in bad shape. One of its eyes was gone, and there was a lot of blood under one of its shoulders. I felt bad, because there was nothing I could do for the woodpecker. As soon as the magpies stepped away, however, it stopped squeaking and was breathing heavily. I left everyone alone and let nature take its course. I was expecting a dead woodpecker when I came back, so I brought a plastic bag with which to carry the corpse (woodpecker skull!). Oddly, EVERYTHING WAS GONE four hours later. Nothing remained of the woodpecker except some primary feathers that had been torn from the hands. The woodpecker was almost as big as the magpies, so they couldn't have flown off with it, but a raven might have. It's the first time I've seen predatory behavior in magpies. I wonder if they actively attacked the woodpecker, or the woodpecker was already injured? 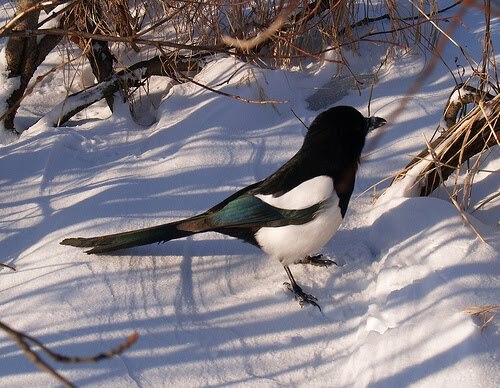 Seeing as magpies belong to the same group as blue jays and crows, this isn't that surprising. Predators will occasionally tackle prey their own size or larger, if they think they can take it in a fight. Magpies do like to relocate and stash food. Perhaps that's the fate of the woodpecker.